"Will definitely back again when I had trip to Bandung." Have a question for MyPodRoom Capsule Hotel? Whether you're a tourist or traveling on business, MyPodRoom Capsule Hotel is a great choice for accommodation when visiting Bandung. The property lies 0.1 km from the city center and provides accessibility to important town facilities. With its convenient location, the property offers easy access to the city's must-see destinations. Every effort is made to make guests feel comfortable. To do so, the property provides the best in services and amenities. Top features of the property include free Wi-Fi in all rooms, 24-hour security, 24-hour front desk, Wi-Fi in public areas, designated smoking area. The property features 22 beautifully appointed guestrooms, many of which include complimentary instant coffee, complimentary tea, locker, towels, internet access – wireless. The property's host of recreational offerings ensures you have plenty to do during your stay. MyPodRoom Capsule Hotel is an ideal place of stay for travelers seeking charm, comfort, and convenience in Bandung. "You got a spacious capsule room and locker for your self." Minimum age of guests is: 17 year(s). 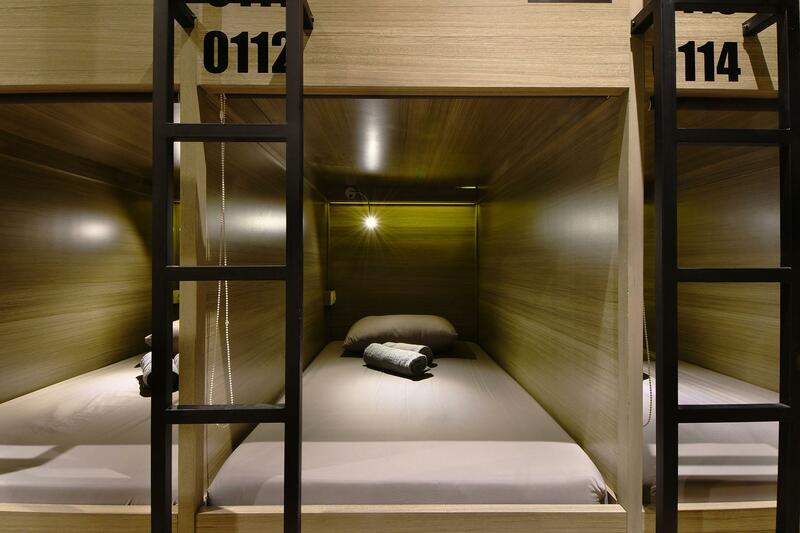 This brand new capsule hotel is just a few minutes to Asia Afrika & Braga Street. At night, you can try various good food in Cibadak Street. It was 5 minutes walk from the hostel. Spacious capsule room, cool A/C, very clean toilet and large space of locker area. I will definitely go back here for my next visit to Bandung. Very clean hostel and very friendly staff. Hostel full fits the description and photos. Beds very soft and comfortable. Breakfast can eat all staying time. Thank you Mrs Risma! Most friendly and helpful receptionist ever, so lovely and great first impression of hotel. The hotel staff were just lovely. I was very pleased with my stay, and although short and sweet this time, I hope to be back for a longer visit in the future. Thanks for the review kak Dimas, its our pleasure to have you in our hotel. Hope to meet you again next time. when i came for the first time, i was being greeted by the staff. They are nice. They kindly inform me about everything. You can have toast, tea and coffee freely for 24 hours. The bedsheets smell really nice too. The location is nice, i could just walk to alun-alun bandung and jl. braga. When I arrived, I was placed on the bottom of the bed. But unfortunately, I didnt get a clothes hanger. even though on the other bed there was a hanger for clothes why I didn't? Then, when I first took a shower, I saw men's underwear in the bathroom together, it looked dirty. But until the third day, the underwear remained there, the staff didnt check the cleanliness of the bathroom regularly every day. And I feel quite disturbed by the other residents who stayed by using the alarm too loudly to be very disturbing. There should be an appeal not to use sound alarms. But the staff is very friendly, and breakfast like bread is available well. Room cleanliness is also maintained, the air conditioner also works well. Security is good because there is CCTV. Strategic location close to the city center and tours. We apologise for the inconvenience Miss Dian, our staff will contact you about this. Had a little problem with my booking but stuff really made up for it. Super friendly and smiley. I plan to stay just for 1 night but extend it for 2 night. The staffs were helpful and friendly especially the female staff, they answer all of my questions and even help me when I haven't ask yet. They provide you with basic breakfast, like toast and jam, and also tea & coffee. Will definitely back again when I had trip to Bandung. I had great time during my stay here. You got a spacious capsule room and locker for your self. They had towel & blanket ready in ur bed, so you don't need to bring it. The location is on walking dintance to alun-alun bandung and braga street. Fasilitas nyaman, lokasi sangat strategis, harga bersaing. 새로오픈한듯하여 매우 깔끔한 시설임. 더도말고 덜도 말고 딱 캡슐호텔. 에어콘은 상당히 빠방하게 틀어주기때문에 잠잘때는 추울수도 있음. 기본 제공되는 담요(이케아에서 파는 폴리담요임.) 조금 얇아서.. 가져간 얇은 점퍼를 입고 잤음. 바닥 메트리스가 단단한 편이 아니라.. 허리가 조금 아팠으나.. 이건 캡슐호텔에 기대할것은 아니기 때문에 불만없었음. nyaman, murah, staf ramah, tempatnya juga lumayan strategis..